Citizens expect politicians to be honest, moral, rational and capable of handling crises, and they are likely to evaluate politicians according to these expectations. However, contravening moral principles might sometimes be the most effective way for politicians to handle crises and maximize aggregate welfare. In some cases, politicians must decide between adopting a utilitarian decision (a decision that, even if it might contravene moral principles, leads to the maximization of aggregate welfare) or a deontological decision (a decision guided by the idea that there are moral standards that should never be violated, even if violating them leads to a maximization of aggregate welfare). How will citizens evaluate a politician that adopts a deontological or utilitarian decision when facing such a dilemma? To analyze this question, I conducted a survey experiment. The survey experiment was based on a sacrificial moral dilemma that I designed following the classic trolley problem. Specifically, I examined respondents’ perceptions of a politician that in the context of a hypothetical terrorist threat makes either a deontological judgement and decision or a utilitarian judgement and decision. Respondents read a vignette about an impending terrorist attack that would kill 50 innocent people that had gathered in a public square. Respondents were told that the mayor of the city could stop the attack, but doing so would require that 10 other innocent bystanders travelling in a tramcar near the square die. Half of the respondents read about a mayor that refused to stop the attack (deontological treatment) arguing that “sacrificing 10 innocent people is just wrong, even if doing so saves 50 other innocent people”. The other half read about a mayor that decided to stop the attack (utilitarian treatment) arguing that “it is better to save 50 people, even if doing so requires sacrificing 10 other innocent people”. After reading about the mayor’s decision, respondents were asked how much they trusted the mayor and how they evaluated the decision he/she adopted. The results summarized in the table indicate that respondents tend to favor deontological decisions. In contrast with mayors that adopt a utilitarian decision, mayors who act in a deontological way tend to be more trusted and their decision is better evaluated by respondents. However, it is important to note that, while the differences between the deontological and utilitarian treatment groups are statistically significant, they are also of reduced magnitude. In any case, the results about the mayor’s trustworthiness are in line with recent findings in social psychology which suggest that upholding a moral principle (for example, sacrificing innocent people is wrong) and acting in line with it—even if it will lead to a sub-optimal outcome—signals trustworthiness. Respondents were also asked whether they believed that the mayor described in the vignette possessed certain desirable traits such as being rational or moral/ethical. The results summarized in the figure indicate that politicians who act in a utilitarian way are consistently considered more rational, while those who act in a deontological way are considered more moral/ethical. 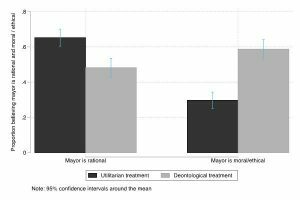 The differences between the deontological and utilitarian treatment conditions are substantially larger regarding the latter characteristic (whether the mayor is a moral/ethical person). This result is probably related to the fact that a substantial number of respondents believe that a mayor who acts in a deontological way can still be considered a rational person, but much fewer respondents believe that a mayor who adopts a utilitarian decision is a moral person. 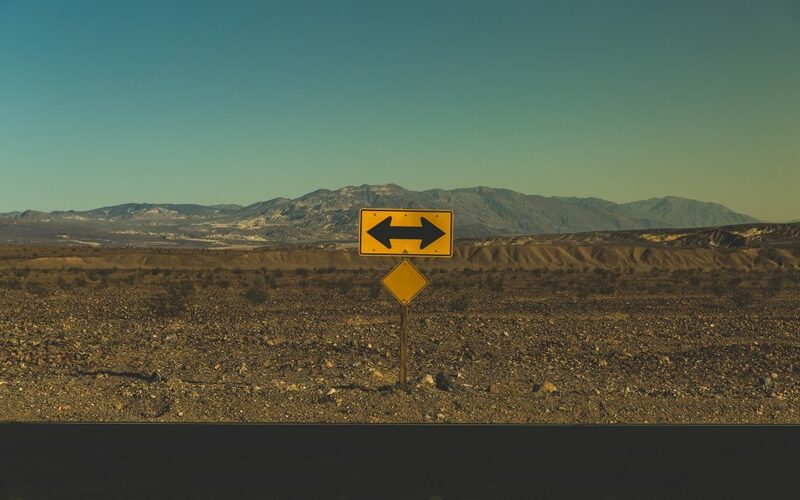 Overall, the results of the experiment indicate that the way in which politicians react to moral dilemmas is consequential for how citizens evaluate them. Further research should analyze whether citizens’ evaluations are driven by their own preferences about how moral dilemmas should be resolved, and whether factors, such as individuals’ ideology, moderate the effects of utilitarian and deontological political decisions. Enrique Hernández is a postdoctoral fellow at the Department of Political Science at the Universitat Autònoma de Barcelona. I also manipulated the gender of the mayor (male/female). The results suggest that the gender of the mayor does not interact with the deontological/utilitarian treatment for any of the outcomes. The results summarized here do not make any distinction depending on the gender of the mayor. All results are restricted to those respondents that passed a manipulation check about the deontological/utilitarian treatment (N = 709). Respondents were asked whether the phrases “is rational” and “is ethical” described the mayor “quite well” or “not too well”.